Power Feed-Assist drillmotor provides 170 lbs. 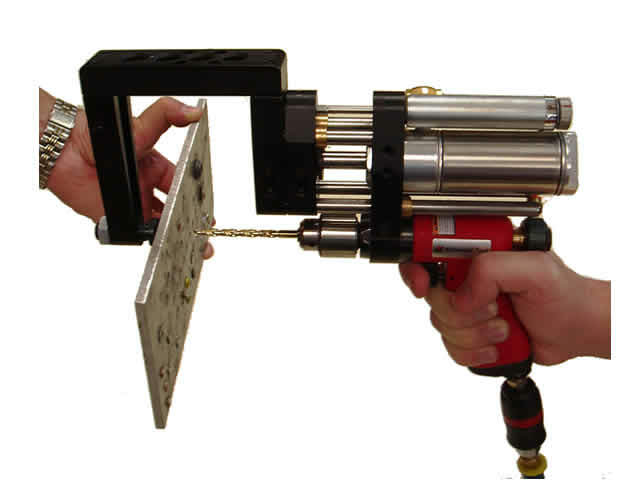 of drill thrust for ergonomic improvement in drilling exotic materials! Clamping action “pulls” drill point normal to the material surface. Available with top-opening c-yoke for bottom of panel work. Power feed drill with adjustable feed rate and drill stroke. Auto-retract and shutoff models also available. Adjustable guide rods for different cutting tool lengths. Up to 7/8″ drill capacity and 2″ total drill stroke. Different C-yoke gaps and reaches available. Larger horsepower motor packages available.